So Ursula was revived by Master Xehanort and dispatched to Destiny Islands. This means that she knows that there are worlds beyond her own (which she knew before thanks to Maleficent) and that she now inhabits Destiny Islands. If Master Xehanort revived one Disney villain, do you think that he revived others? Why was Ursula chosen to go to Destiny Islands? Does this confirm an appearance in KH3? As for why she was choosen. Maybe because she was a sea witch, she would be the best choice to send to a island world. If you notice. In the DDD's reports, character descriptions whatever it's called she's referred to as "Phantom Ursula". Meaning I wouldn't count her as being the real one or at the very least I wouldn't put to much thought into her. On top of that she vanishes after she's defeated further making what she really was unknown. There wasn't no dramatic death like the other times with smoke and yelling she literally just faded. I've always been curious about what she says when she first appears: "Oh, he was right. Those wretched guppies are here. Well, it's about time we settled the score." I assumed she was talking about Xehanort or one of the other norts. Plus, the conversation really doesn't seem like someone fake. Well the reason why I brought it up was because what she said was confusing. The line Tartarus just brought up. "He was right" and "Time we settled the score" doesn't sound like something a phantom version of Ursula would say. It sounds like the real Ursula being dispatched by someone to get Sora and Riku. That someone was most likely Master Xehanort. Her phrasing is off but she's still listed as "Phantom Ursula" which leaves it odd. Her being sent by Xehanort though, to me, is a no brainer. Though not really sure why he'd do so. All Xehanort, Ansem specifically, had to do was be there when they entered the Realm of Sleep so the others could could follow them in. It just makes me think that if Xehanort revived her to go after Sora and Riku, who else could he have revived? It makes me think that Xehanort is planning on manipulating the Disney villains again. Also, I agree that she was probably sent because she's a water based enemy. The fact that Ursula showed up makes even less sense to me apart from them wanting a water villain for that scene. She's alive in KH2 for a bit, was that Maleficent's doing? Are we agreeing that she was truly a phantom in DDD's opening? If so, who could have summoned her there? Does anyone else but Maleficent have the ability to revive villains, that we know of? I didn't think that was in the skillsets of Young Xehanort or Ansem or anyone but Maleficent... but then 'he' would have to be Pete and how in the heck would they know? Ursula was murdered in KH II. When she appeared in KH 3D she said that "he" was right about Sora and Riku being on Destiny Islands. That means that a male had to revive her and send her to Destiny Islands to kill Sora and Riku. The male in question could be Pete, but the fact that the agenda of Xehanort was to get Sora and Riku to open the Sleeping Realms and for Ansem SOD to follow them in... makes it seem as if Xehanort revived Ursula and dispatched her to Destiny Islands. Ursula's rebirth in KH II and Ariel's "memory loss" are still a mystery to this date. I just think that Ursula's usage points out that she was chosen for a reason, probably to be revealed in KH III. I mean it seems like Atlantica is a very important world. 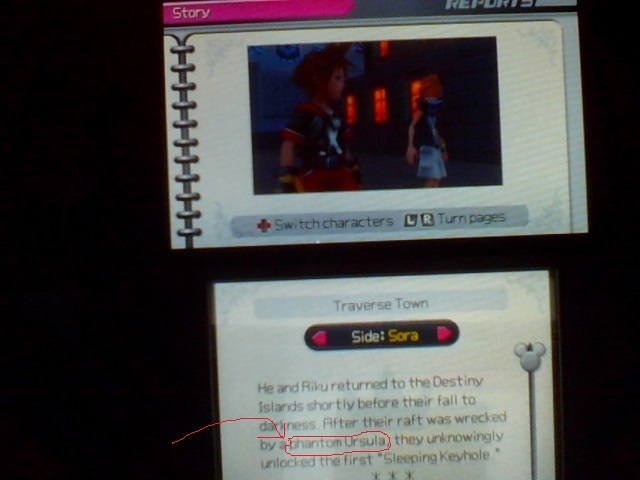 Triton knew about keyholes and now Ursula was chosen by Xehanort - personally - to go after Sora and Riku. I do remember her dieing in KHII, yes. What I was getting at is that she was killed in KHI as well, and as you've confirmed it was never really explained how she came back for II - most people probably assumed it was Maleficent meddling like she did with Oogie in KHII. You may be onto something with her appearance being more important than it seems what with Triton also seeming to be more important and well versed in lore than others (as far as we know). I for one hope you are right, because I really would like them to increase the importance of Disney stuff like that. Alright, totally a rookie question here but definitely in the right thread... why did they go out onto the raft anyway? Weren't they just supposed to be on the island at the time the world fell to darkness? Why did they need to be on the high seas? Honestly? There is no answer to that. Ag current it just seemed to be a setting for a tutorial battle. Because he's Ansem. No seriously that's the answer. Young Xehanorts answer was literally because that Ansem was there. It's not really that big a conundrum really, Ansem sees Sora and Riku arrive and follows them. Are we agreeing that she was truly a phantom in DDD's opening? In the end you're probably right that it was just a tutorial excuse. Of course we all like to hold Nomura and Co. to higher standards than that so if that's what it's left at... bummer, man. The Ansem thing is also pretty funny. I know that's the answer but then I have to ask... how did he even know they'd be going to try to enter the sleeping realm? How did he know to wait for them on the island? My knowledge of DDD gets shakier every day so am I just forgetting something? As for the phantom bit, thanks for clarifying. That still blows my mind, though. I would love that, but I don't have high expectations for it. Outside of Maleficent, Yensid, Merlin, and the Disney Castle crew, the Disney characters have no purpose outside of repeating their movie lines. I guess you could throw in the PoH, too, but that's only because of the title--they don't do anything. I wouldn't rule it out as possibly becoming a thing like secret bosses tent to but until it does I wouldn't place it as being higher than just tutorial stuff. Haha Sadly those are answers not bluntly said. All that we know is Ansem knew to be at Destiny Islands. So far Xehanort's entire scheme in DDD is being boasted on, by the game characters/story, Master Xehanort's outrageous amount of foresight. Of course it's probably easier to blame it on the time travel mess Ansem started. Don't forget YX gained that power and his mission from Ansem meaning Ansem was using time travel first. I wonder if they meant for the Phantom Ursula to be used as a "dream" due to the dream theme of 3D, and hence would be a good excuse to use anyone. Then they messed up by including the line "he was right" which then suggested that Ursula was more than a phantom. At first I thought it was just a dream version of her, hence phantom, but that line just gets me. It makes me really think that Xehanort sent Ursula to Sora/Riku on purpose. What if it was Xehanort that purposely brought back Ursula in KH2? This all makes me think that Atlantica, Triton, and Ursula have a bigger role somehow. Triton knows about the keyhole and Ursula seems to be a favourite of Xehanort's. Why? Hmm...Honestly I find Xehanort bringing her back in KH2 or using any disney villains in 3 a slight less than "maybe" because by the end of DDD Xehanort now had 12, and by KH3 13, versions of himself to use as pawns. So him needing or caring about any disney villains just seems nil to me. I do wonder how ursula was a "phantom" version though. Maybe an illusion he made? Well that makes me wonder what purpose Disney will even serve in KH3. The objective of KH3 is confront the 13 darknesses. So then would Xehanort even want to hurt Sora and the other lights? Now that I think about it, why would he send Ursula to kill Sora when he needs him. Honestly Disney has served little purpose since CoM onwards. If disney gets any relevance again outside level filler and traveling buddies it'll be through Maleficent not Xehanort.